Rent a 4 person golf cart for just $399 for the entire week of your Outer Banks vacation. If you have more people to take with you, a 6 person golf cart is for you! Rent a 6 person golf cart for just $549 for the entire week. Renting a golf cart from OBX Beach Toy Rentals will make getting around during your Outer Banks vacation a breeze. Imagine rolling up to the beach access with everything loaded neatly in a golf cart, rather than lugging coolers, beach toys, chairs, umbrellas and tents down the street with all the kids and in-laws in tow. Our golf carts ensure you won’t even break a sweat as you head to the beach! Whether you’re shuttling family to the beach, running errands or leisurely making your way to your favorite restaurants or attractions, riding in a golf cart will change your perspective during your visit to the Outer Banks. Moving slower with fresh air in your face and no view obstructions, you’ll notice things you’ve never noticed before. You’ll stop to talk to passersby, run in and out of shops easily and not spend a dime on gas. 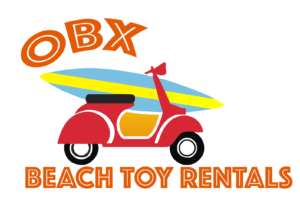 OBX Beach Toy Rentals offers 4 person golf carts and 6 person “limo” golf carts for rent during your Outer Banks vacation. All golf carts are eco-friendly electric and include a power cord to recharge the cart after each use. All of the golf carts include safety features like headlights, taillights, safety belts and mirrors, plus comforts like canopies, cupholders and folding rear seats, which make transporting beach gear easy. Anyone age 18 or older with a driver’s license is allowed to operate the cart. We deliver the golf cart to your rental house so it is fully charged and ready when you arrive. Just leave it plugged in when you leave, and we’ll take care of the rest! Our golf cart rentals are only available from our Corolla store. Some of the Corolla golf cart rental communities that we serve include The Currituck Club, Whalehead, Buck Island, Spindrift, Monterey Shores, and The Village at Ocean Hill. Reserve your golf cart now and have it ready for you when you arrive. Golf carts are popular on the northern Outer Banks, so make your reservation well in advance. Please call our Corolla store with any questions about our golf cart rentals: 252-597-3000.